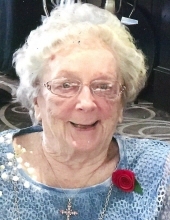 KADARAS, IRENE H. (Ropeika) of Middleton formerly of Norwood and Worcester passed away on March 28, 2019 at the age of 89. Devoted mother of Kenneth Kadaras and his wife Joan of NH, Joseph Kadaras of FL, Karen L’Esperance of Lakeville, Cynthia A. LeBlanc and her husband Thomas of Middleton and the late Edward Kadaras. Cherished grandmother of Andrew, Catherine, Daniel, Jonathan, Allison and Ryan. Great grandmother of Daniel. Sister of the late William Ropeika and Ruth Bartczak. Daughter of the late Peter F. and Anlos (Kasulis) Ropeika. Irene was a member of Mad Maggies, Brownies Swim Team in Norwood. Funeral from the Kraw-Kornack Funeral Home 1248 Washington St. Norwood, Monday April 1, 2019 at 10am followed by a funeral mass at 11am at St. Catherine of Siena Church Norwood. Visiting hours will be held on Sunday, March 31, 2019 from 2-5pm. Burial will be at Highland Cemetery Norwood. To plant a tree in memory of Irene H. Kadaras, please visit our Tribute Store. "Email Address" would like to share the life celebration of Irene H. Kadaras. Click on the "link" to go to share a favorite memory or leave a condolence message for the family.